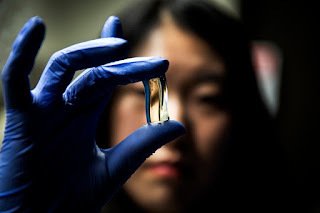 Minjeong Cha, an author of the research article, holds up a sample of the gel infused with chiromagnetic nanoparticles. Photo: Joseph Xu, Michigan Engineering, Communications & Marketing. Magnetic nanoparticles with chiral distortions in their crystal lattice provide an unprecedented degree of control over circularly polarized light. The effect, which was demonstrated by the nanoparticles embedded in a transparent gel and exposed to a magnetic field, can be understood thanks to careful consideration of the magnetic field of the photons, in addition to the familiar electric field. Where magnetism and chirality (a lack of mirror symmetry) overlap there are often intriguing discoveries. These two concepts are fundamental to the advancement of spintronics, chiral catalysis and magneto-optics. Much of the research in this field aims to enhance the interaction between electrons in matter and the (often ignored) magnetic field of a photon. A recent and very successful example of such an attempt is the work from Nicholas Kotov and collaborators in the University of Michigan, USA, and the Federal University of São Carlos, Brazil. The researchers created a material comprised of magnetic nanoparticles (NPs) with a chiral or twisted crystal structure encased in a transparent gel. This chiromagnetic gel responds to circularly polarized light with a sensitivity 10 times greater than previously observed in similar non-magnetic composites. Lauren Barr is a PhD student contributor to nanotechweb.org.